When things are rolling for you, they roll for you. Really, you enter a race with three credible rivals, yet one has dropped out before the race has even started and the other two have had their days severely compromised as quickly as the point of exiting turn one. Already the day is as good as yours. It's hard to imagine how it gets much better. That's exactly what happened to Nico Rosberg in today's Bahrain Grand Prix. First off Sebastian Vettel didn't last even to the end of the parade lap, his Ferrari engine going pop; redolent of Michael Schumacher in France 20 years ago. The red cars' reliability hasn't looked near to being perfect in the 2016 calendar year and in this instance F1 once again demonstrated that it abides closely by Murphy's Law. He too was suitably elated about it afterwards. "It's going great, a good moment, of course I'm enjoying it" he said of the roll that he's got himself onto. "It's been a great weekend from start to finish". 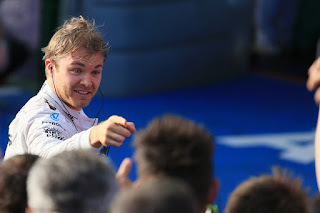 Indeed, on this point, sight should not be lost that even with his fortune today Nico's nevertheless looked the man to beat for pretty much the whole time at this Sakhir gathering, aside from his team mate's astonishing qualifying lap at the last yesterday. "It's really been the start that cemented it" Rosberg went on, drilling down to specifics. "Got a really great getaway and it was a really good feeling." As for what he knew about Lewis's early problems? "They [the team] told me more or less where everybody was, so from then I knew that I just had to keep my head down and go for the win with the car that I had. We just played as safe as possible, going for the safest possible strategy not the quickest..."
Raikkonen just like last year at this track put in fine, fighting drive to second, and today he added in many fine overtakes to get there, usually it seemed on the outside of turns. 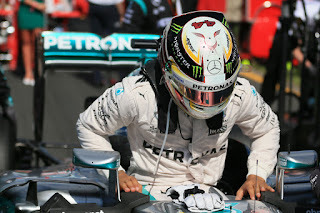 Like last year too he kept the pressure up all the way in case just like then the Mercs ran out of brakes late on. But unlike then they didn't. 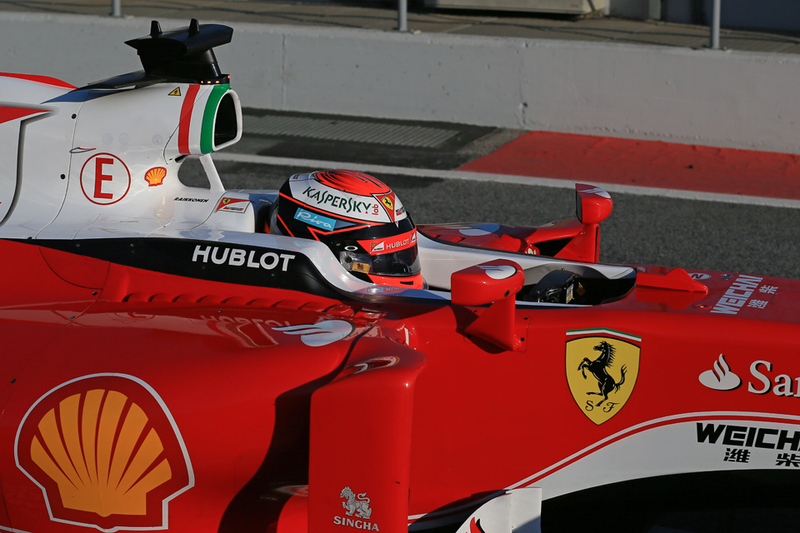 Still though the improved Kimi for 2016 that pre-season hinted at was, on today's evidence at least, a reality. "This is what we got and we made the best out of it" said the Finn. "I got a very poor start so we were so far away from Nico after I got past the people that passed me on the start...I'll take second place after the first lap". 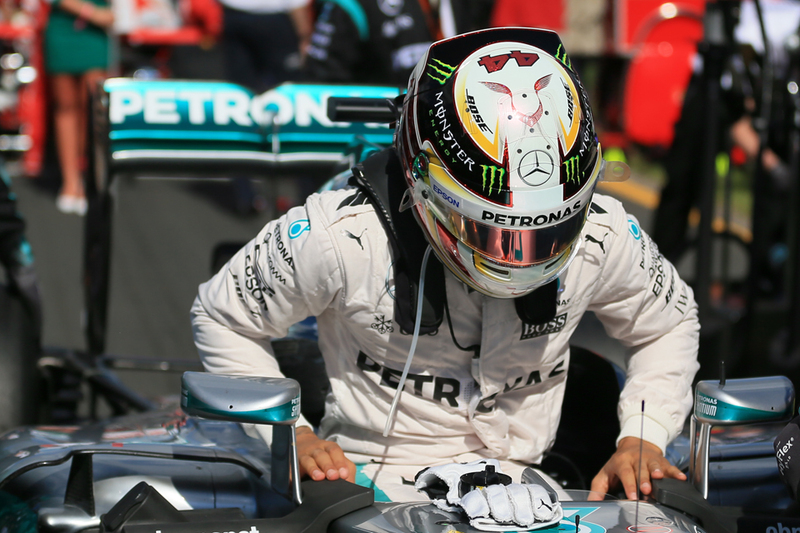 For Lewis it was a lot like Australia's season-opener two weeks ago - a pole position turned into a day irrecoverably dented at the first turn. Like then he did well to salvage what he could - this time third place - but will be impatient as to when exactly he'll get a clear run. "That's motor racing", said a sanguine Lewis later. "I'm just glad that I could keep going". As for how much he was impeded by the damage from the first corner contact, "I don't really know...the car was sliding around quite a bit but I did the best job I could with what I had. "I was just trying to recover from that...At the end of the day I had damage on my car and couldn't keep up with Kimi". He did though accept culpability for his poor start. 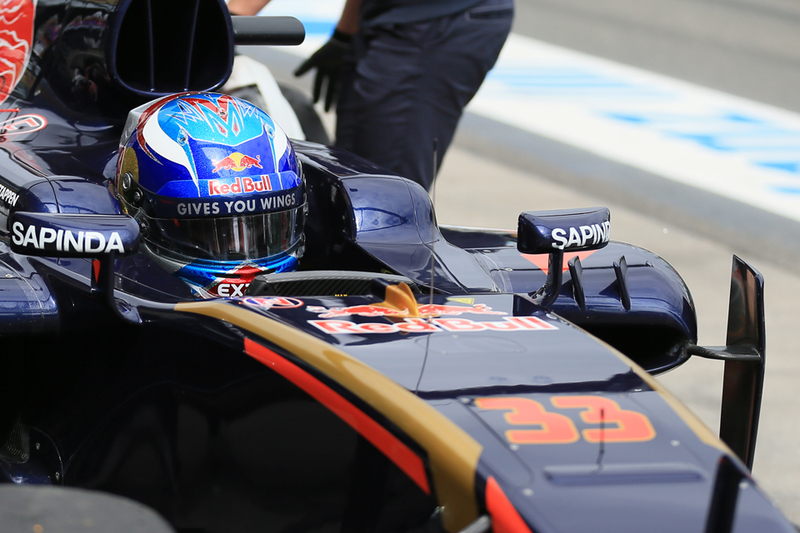 "The reaction time I think was not good enough, so I don't think there's any real performance issues [with the car]". In another parallel with Melbourne two weeks ago Daniel Ricciardo was a clear best of the rest and was hard to fault on the way to coming fourth. Yet he got there upwards of a minute after Nico, underlining what we knew, that the Mercs and Ferraris are simply on another level from the rest at the moment. The other Red Bull indeed, Daniil Kvyat's in P7, was lapped. Williams had another disappointing day. It looked a net winner from the turn one shenanigans, running P2 and P3 indeed albeit tempered when Bottas later got a drive through for his contribution to the said shenanigans. Somehow by the end though the Grove pair had sunk to a lapped P8 and P9, not helped by using the medium tyre for a time which was not the way to go. While this won't be much consolation down Williams way the wider range of compounds available again proved a success to the fare we got to see. And while it's easy to miss Force India also just like in Melbourne disappointed. Barcelona testing when many predicted that the Silverstone squad could be best of the rest now seems from another universe. 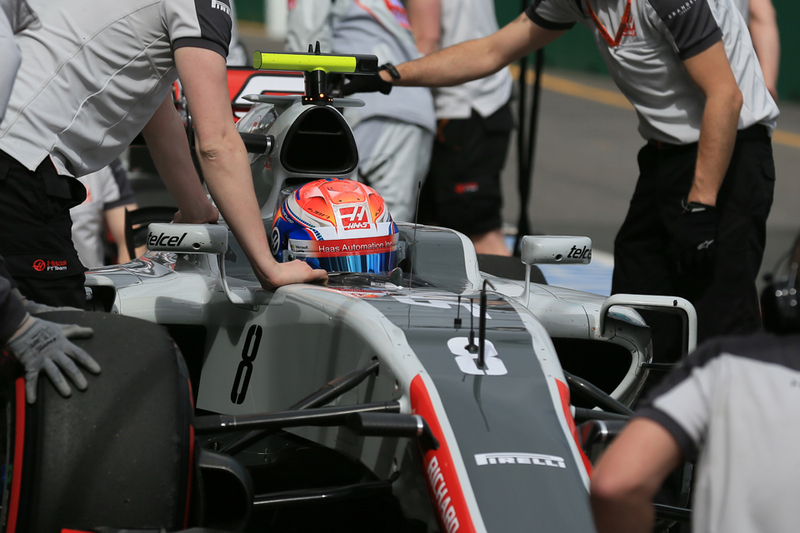 Today they crawled home in a mere P15 and P16, beating only Rio Haryanto's Manor. More in line with expectations is that Max Verstappen and Toro Rosso impressed again, this time coming home sixth. Indeed it felt like rather a good day for the sport's next generation. Last minute McLaren supersub Stoffel Vandoorne was fast, flawless and combative in bagging a point for tenth (and did so having only read the car's manual on Thursday), Kevin Magnussen did well to recover from a pit lane start to end up one place back from his former FR3.5 rival, while Pascal Wehrlein in the Manor fought among far more prestigious cars on his way to P13. One thinks of Fernando Alonso, Mark Webber and Jules Bianchi - those who have distinguished themselves in tail-end machinery. Wehrlein could be the next. But once again much of the chin-wagging will be about the Haas team, which went one better even than in its Melbourne run and finished fifth, again in Romain Grosjean's hands, and didn't benefit from fortuitously-timed red flags this time. Sadly though for the freshman team some of the chin-wagging will be the poisonous sort, what with the team's unique model of exploiting the 'listed parts' regulations to their maximum. But it's all above board, and in an age where the midfield teams and back with more standard approaches are locked in desperate financial plights it can be said to be sensible too. While the extent that it's copied Ferrari surely is over-stated as after all it designed its own aero and outsourced its chassis build not to a competitor but to Dallara. Yet somehow, because it's Nico and all that 'entails', it comes accompanied by a certain element of doubt. So far this season things have gone his way certainly; almost at no point has he been in direct battle with a rival. It's also as Nico himself reminded us but round two from a marathon 21. But equally it cannot be denied that he's been making the absolute best of it. It all has a distinct whiff of 2014, the first part of that campaign anyway. 1982 and all that - is history repeating?